The saints commemorated in the calendar and litany of this Psalter point without doubt to its having been made for an Augustinian house in East Anglia, and this house is very likely to have been Barnwell Priory, on the outskirts of Cambridge. 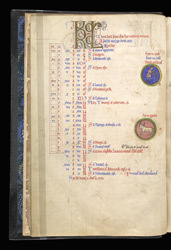 This page is April, in the calendar which precedes the other texts. Roundels depict the Occupation of the Month, in this case dressing vines (? ), and the zodiac sign, Taurus the bull. A little below Taurus is an added 13th-century inscription in black ink, recording the death of John, father of E., precentor of Chichester. This suggests that the Psalter was taken from Barnwell to Chichester fairly soon after it was made.